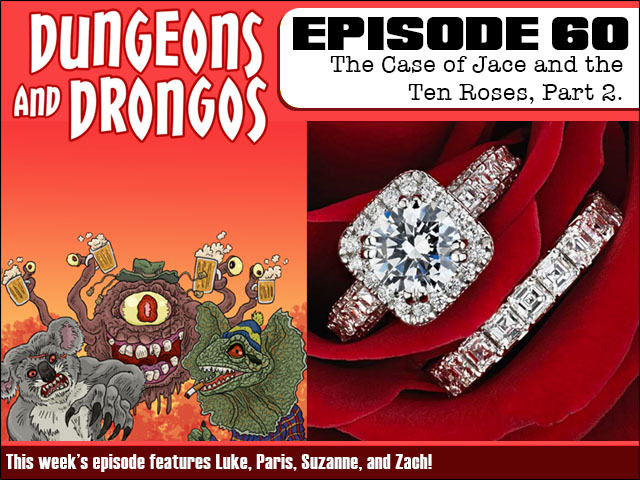 Dungeons and Drongos Episode 60: The Case of Jace and the Ten Roses Part 2! By Fruitless Pursuits. Discovered by Player FM and our community — copyright is owned by the publisher, not Player FM, and audio streamed directly from their servers. This week Jace Hemsworth's search for viable love continues as his eclectic bunch of suitors - including two disguised, but familiar adventurers - are put through a variety of challenges to cull them down to a single candidate. Who will win Jace's hand in marriage and earn their place among the Hemsworth royal family? It's Dungeons and Drongos set in Fantasy Australia, cobbers! 80 episodes available. A new episode about every 8 days . Dungeons and Drongos Episode 81: Wizard World! Dungeons and Drongos Episode 73: The Fast and the Franchises, Part 1! Dungeons and Drongos Episode 72: The Deferred Primer of the Interred Rhymer, Part 2! Dungeons and Drongos Episode 70: The Land Down Under, Part 2! Dungeons and Drongos Episode 68: Mark Hall, the ChrisTmas Prince, Part 2! Dungeons and Drongos Episode 67: Mark Hall, the ChrisTmas Prince, Part 1! Dungeons and Drongos Episode 66: Raiders of the Lost Tucker Box Part 2! Dungeons and Drongos Episode 62: The Babadouche, part 2! Dungeons and Drongos Episode 58: Crikey Moses! Secrets of the Shortsword Part 2! Dungeons and Drongos Episode 57: Crikey Moses! Secrets of the Shortsword Part 1! Dungeons and Drongos Episode 56: The Royal Bush Bash, Part 2. Start listening to Dungeons and Drongos on your phone right now with Player FM's free mobile app, the best podcasting experience on both iPhone and Android. Your subcriptions will sync with your account on this website too. Podcast smart and easy with the app that refuses to compromise.